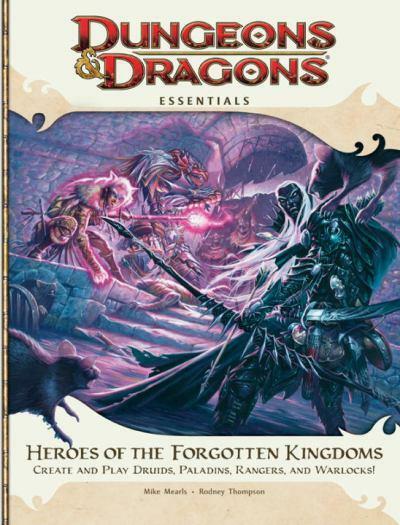 Last week I picked up my copy of the latest D&D Essentials book, Heroes of the Forgotten Kingdoms. Like its predecessor, Heroes of the Fallen Lands, Heroes of the Forgotten Kingdoms is meant to be an evergreen starter book for people interested in playing the Dungeons and Dragons role playing game. Where Fallen Lands featured rules for characters who fall within the four "classic" D&D archetype classes (Fighter, Cleric, Wizard, and Thief) and major races (Human, Halfling, Elf, and Dwarf) that made up the core of the Moldvay Basic Set when D&D was young, Forgotten Kingdoms introduces "classic" archetypes from the pages of the Advanced Dungeons and Dragons (Paladin, Ranger, Druid, and Ranger) game with one addition -- the Hexblade -- as well as a host of new races (Dark Elves, Half Orcs, Dragonborn, and Half-Elves). Both Fallen Lands and Forgotten Kingdoms are excellent products that accomplish the tasks they are attempting. The first three chapters of each book is identical and provides an overview of the basic mechanics of the D&D game system. If someone wants to play D&D as a player, all they need is one of these books and they are good to go. Their taste in archetypes can be used to determine which book they wish to buy, or they can buy both books which is my recommendation. None of the class builds in the books exist in other books and the classes are presented in a way that is easy to understand and learn. But one question lingers at the back of many players brains. What exactly are the Fallen Lands and Forgotten Kingdoms that are referred to in the titles and how do they relate to the characters and races presented in the books? This is where the books truly shine. While the information is only hinted at in the flavor text throughout the books, after reading The Mark of Nerath I had a bit of an epiphany. The "Fallen Kingdoms" are the recently fallen kingdoms of man, chief among them the Empire of Nerath. The Empire of Nerath was a strong empire that once ruled the dangerous area that makes up the Points of Light setting, but which fell victim to a curse due to a bargain that Nerath's founder, Morgath, entered into 500 years ago with Orcus the Lord of the Undead. As a recently memorable kingdom, having "fallen" within the past century, the character archetypes and races depicted are of the more mundane sort. Nerath was less fantastic than the kingdoms of the past and was filled with Fighters, Mages, Clerics, and Thieves. Elves (both Woodland and Fey), Dwarves, Humans, and Halflings walked its streets. These are the classes and races that the book presents to the characters. The "Forgotten Kingdoms" of Arkoshia and Bael Turath collapsed long ago and their origins are lost and filled with mythical imagery. The Dragonborn Empire of Arkoshia was founded by those who sought to glorify Bahamut the Drakonic god of Honor and Duty. The land was filled with the stoic (in the philosophic sense) and sturdy Dragonborn and its Paladins are things of legend. Bael Turath was an Empire founded when a band of humans made a pact with Asmodeus, a pact that magically cursed those humans to become Tieflings, in order to attain glory. The events that collapsed these great empires are "forgotten," but their legacy remains. "Forgotten Kingdoms" presents classes and races that are more "magical" and alien to the world, or that echo those ancient empires. For example, today's Essential Paladins are no longer able to summon the wondrous and magical Holy Steeds that Paladins of the ancient kingdoms could summon. The modern Paladin can only summon an echo of that great ability by channeling the spirits of those glorious Holy Steeds into the mundane beasts they and their companions ride into battle. The powers of the epic Paladins are lost to time, but the residual essence remains. I am mesmerized by the presentation. My only critique is how this relationship must be trepanned out of the text rather than openly stated. 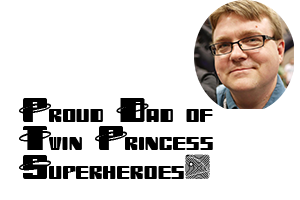 I remember the old AOL Greyhawk group, where we would mine for minor details in each D&D module to find a kernel of information about the World of Greyhawk. These two Essential rulebooks are filled with nuggets that hint at the glory of the Points of Light setting and the Nentir Vale. I hope they give us some more explicit information, as I am enjoying the subtle hints. I've seen the question about the Fallen Lands and Forgotten Kingdoms come up before. I thought it was odd that people weren't getting the meaning because in all of the essentials books doesn't it say something about kingdoms and empires rising and falling? I don't have my books with me at the moment, but I seem to remember seeing something like that in the section discussing the world. That may or may not have actually been a reference to the Fallen Lands and Forgotten Kingdoms, but that's how I took it. Now that I've started reading the Nerath book I see it there as well.